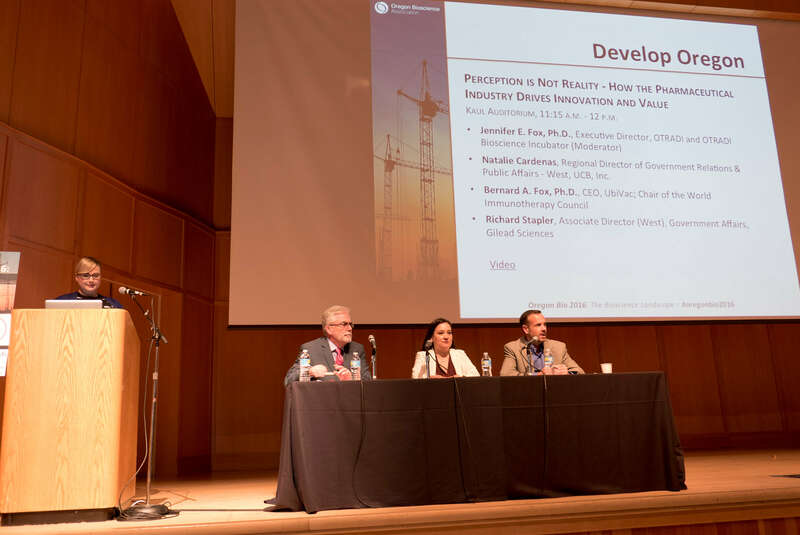 From a panel of futurists to rockstar entrepreneurs and scientists, Oregon Bio welcomed more than 300 attendees to its signature annual conference. 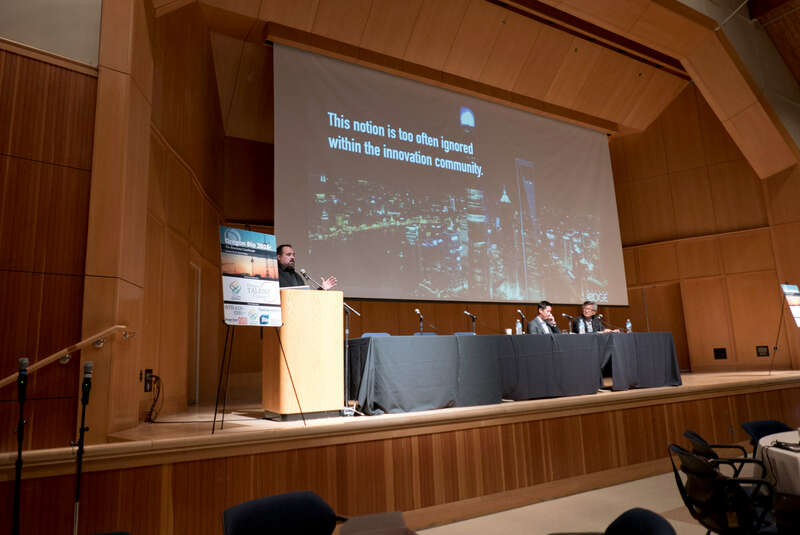 The Company Pitch Showcase and Research Fast Pitch, both held on the first day of the conference, highlighted exciting startups and research scientists from Oregon. 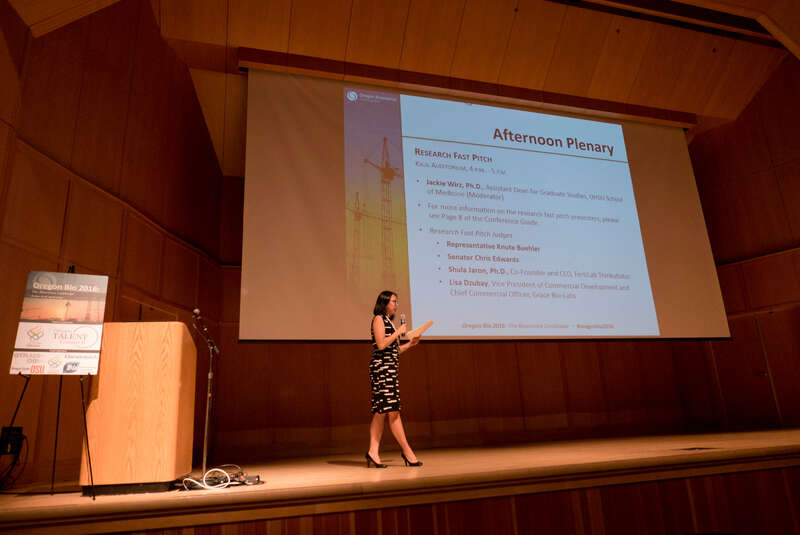 Attendees were also able to visit research posters presented by Oregon State University students and delve into the range of professional development and translational research/tech transfer topics during breakout sessions. Day one ended with an awards ceremony and jam session with blues band, Holfar Blue. 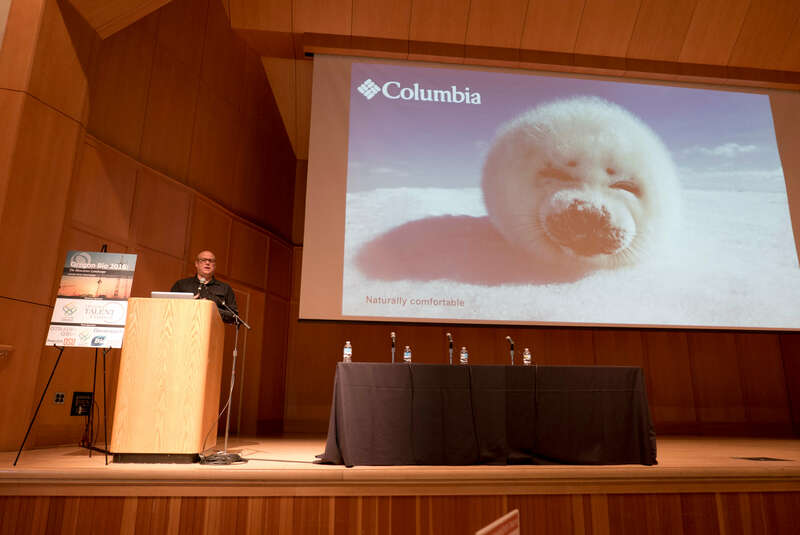 The second day of the conference highlighted innovation and collaboration with other sectors, from innovation strategy at Columbia Sportswear to the future of precision medicine at Intel Life Sciences. 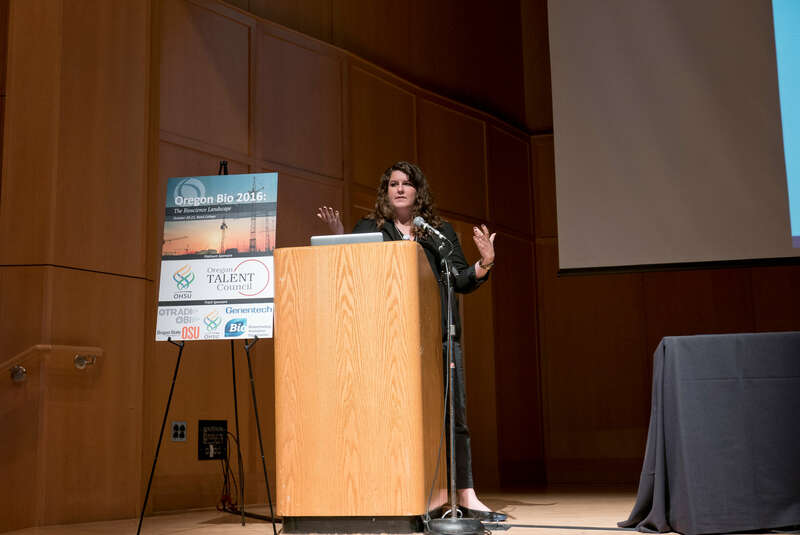 Attendees also heard from expert speakers on diversity topics, including generational differences and unconscious bias, and on developing bioscience throughout Oregon. 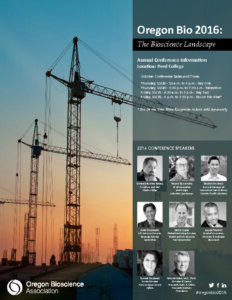 Throughout the day, 26 exhibitors from Oregon and throughout the U.S. interacted and networked with conference attendees. 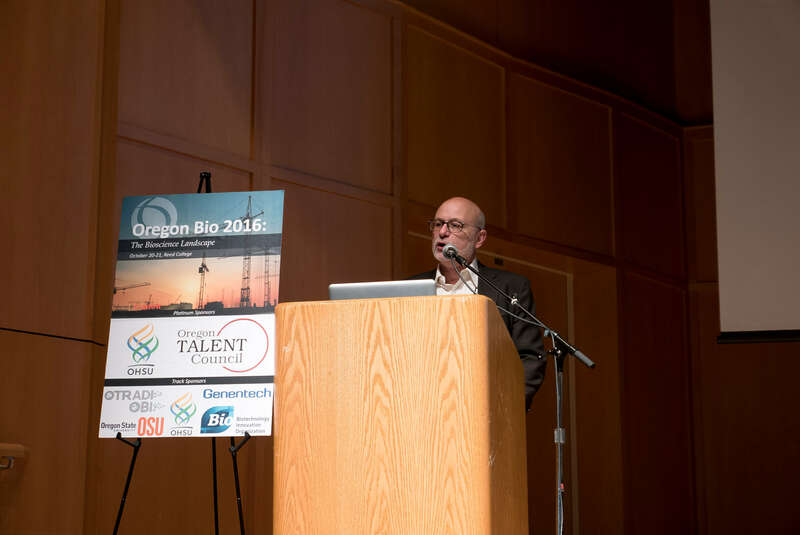 The second day of Oregon Bio programming closed with a keynote highlighting bioscience legislation and remarks and Q&A with U.S. 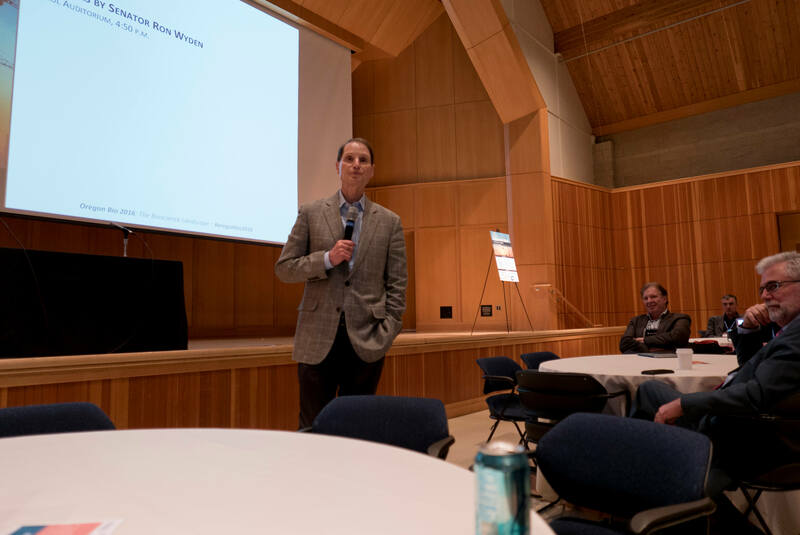 Senator, Ron Wyden. 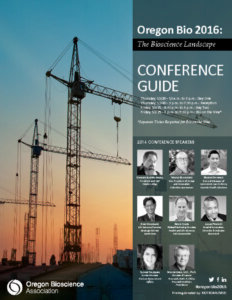 Oregon Bio 2016 attendees were able to attend our signature Bio on the Vine event immediately following the conference. Eight Oregon wineries were on hand to pour samples of 22 signature wines to nearly 150 Bio on the Vine attendees. DesignMedix, Inc. develops drugs to address the large medical need caused by the rapid rise in drug resistance in multiple diseases. Diseases like malaria and diarrhea kill millions of people each year and cause untold suffering. The World Health Organization considers drug resistance to be one of the top three threats to human health today. Using proprietary technology, DesignMedix is developing novel drugs to help efforts to alleviate and eliminate these deadly infections. Madorra is empowering women to live fuller, healthier lives. They are changing the paradigm for treating vaginal dryness by providing a medical device solution to a problem that has previously only been served by pharmaceuticals. Madorra elicits natural, physiologic lubrication and restores vaginal health. The product is giving post-menopausal women and breast cancer survivors the new option to choose the non-hormonal treatment option they want. 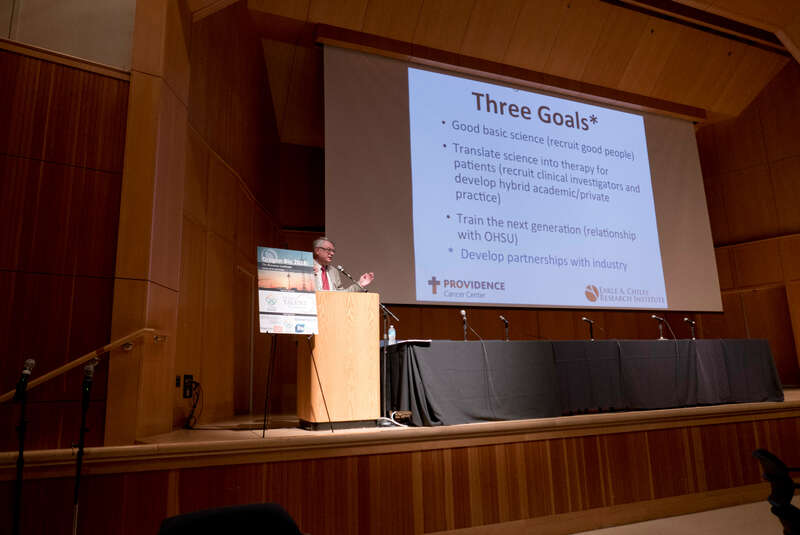 The Providence Cancer Center partners with a wide range of sponsors to conduct drug trials that leverage both clinical expertise and a comprehensive portfolio of cutting-edge analytical technologies. A major challenge is the integration and analysis of the complex data sets generated by these trials. 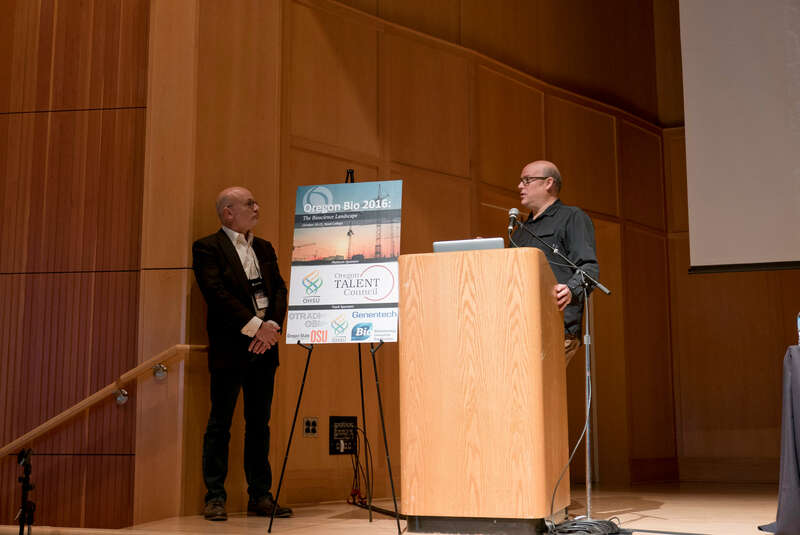 To address this need, Dr. McNamara and his team have developed software solutions that allow integration of virtually all of the data streams generated by the clinical trial program and those generated by external sources. 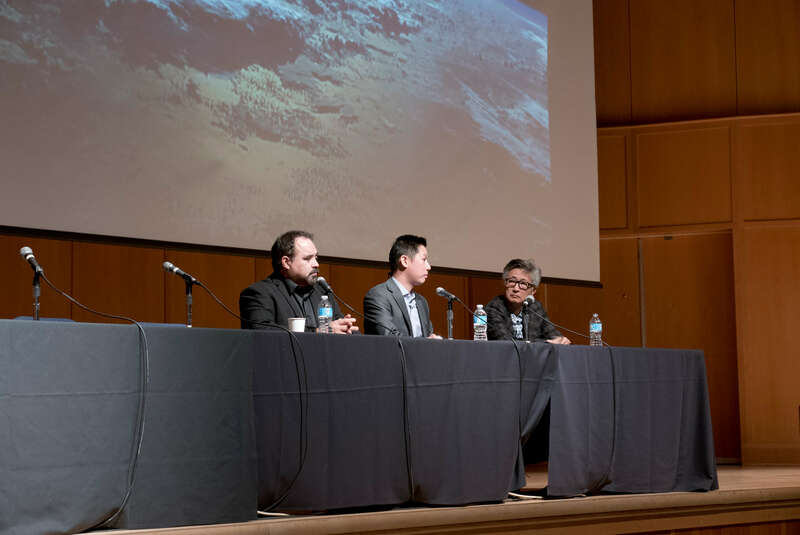 The team has also developed advanced data-mining capabilities that deliver a range of actionable insights that can help accelerate research efforts and improve the odds of achieving regulatory approval. 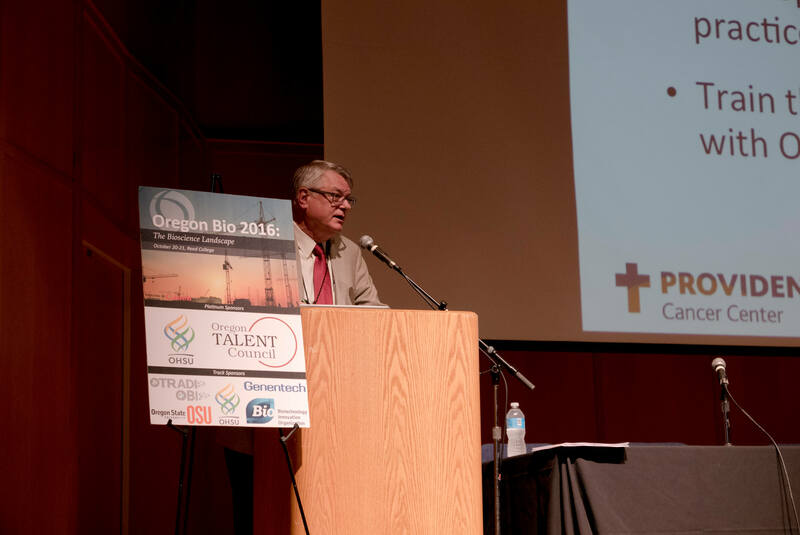 Thank you to everyone who participated in the #oregonbio2016 twitter challenge. 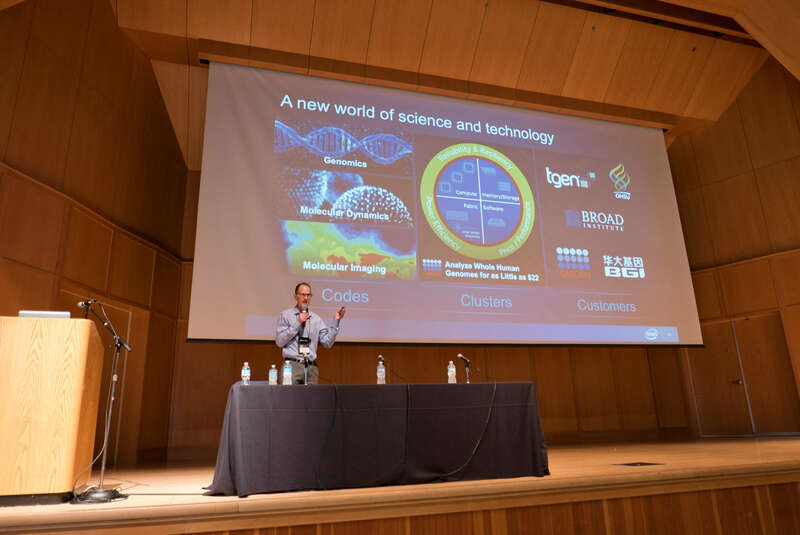 During the conference, attendees wrote 200 original tweets using #oregonbio2016 and were entered in a random drawing to win a $50 Amazon gift card.